Woody Allen, who has perhaps the longest success streak in entertainment history, can lift characters and plots from eight decades of living in his own dramatic episodes. His manipulation of characters as a reflection of his own reality has become a comic guessing game for audiences. 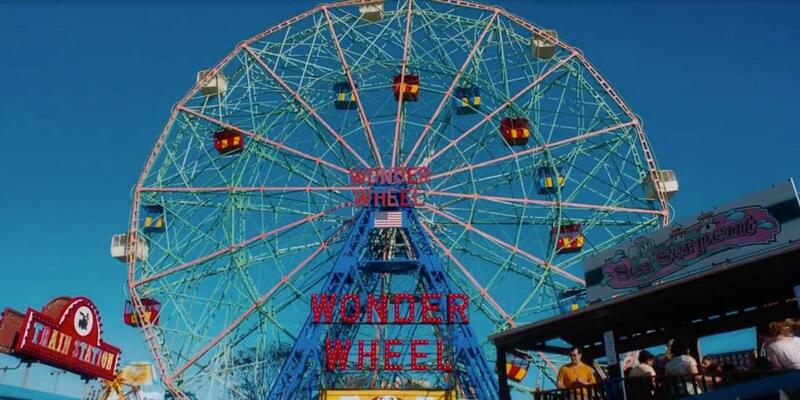 There is ample fodder for all in his latest, Wonder Wheel. Allen’s first step is a good one. If he had laid this story of domestic misery in an ordinary town, it would be just another story of family dysfunction. Instead, the whole thing unfolds in Coney Island of the 1950s. The things that some of us love about amusement parks – music, merry-go-rounds, smiling people enjoying a day off – are the very things that initiate misery in the family he has planted there. This is a complicated cast. Humpty (Jim Belushi) has been reduced –in his eyes – to operating the carousel that drives his wife Ginny (Kate Winslet) nearly crazy with its noise. They live just above it in an apartment that delivers the ruckus throughout day and night. Ginny’s son Richie (Jack Goreis) is a nutcase who starts fires here, there, and everywhere. When Humpty’s daughter Carolina (Juno Temple) arrives on the run from her gangster husband, she injects danger along with sorrow into the grim home. Stepmother Ginny is having a beneath-the-boardwalk affair with Ken (Justin Timberlake), the lifeguard on the beach who sees himself as an intellectual researching his future as a successful playwright. Is all this enough of a backdrop for domestic trouble? When Humpty invites his wife Ginny to go fishing and to ball games, you can imagine her reaction as a former actor who hates everything about Coney Island, the place she sees as a last redoubt for losers. She is bitter about nearly everything. And so you have a perfect Woody Allen cast: a tough couple who hates where they live, a young arsonist, a girl scared her gangster husband will rub her out, and a pretentious intellectual lifeguard. For Woody Allen fans, the fun of all this may lie in trying to figure out which of these characters were created from people in his own life. Who brings all this to life? Kate Winslet is effective in creating a bitter woman who has failed at everything and harbors one last hope of happiness with Justin Timberlake’s oddly fake aspiring intellectual. She does a fine job of stewing in the failure that surrounds her as she turns forty. Juno Temple begins as a too sweet young thing to have married a gangster but grows into her role as the only pleasant person in the story. Jim Belushi’s Humpty roams from physical and emotional rage to protective dad. In this atmosphere of resentment, abuse, affairs, and hatred of location, your greatest fun may lie in figuring out which parts of Woody Allen’s life produced these odd characters. For me, the only saving grace was the wonderful carousel music they all hate. This review was posted on December 16, 2017, in Drama. Bookmark the permalink.